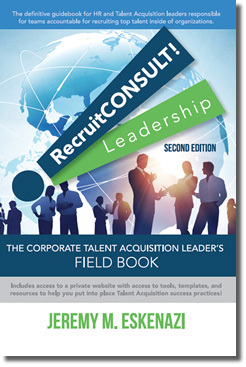 About the Book | RecruitCONSULT! In “RecruitCONSULT! Leadership: The Corporate Talent Acquisition Leader’s Field Book, Second Edition”, Jeremy M. Eskenazi refreshes his successful first edition of the ultimate field guide for Talent Acquisition leaders. It’s been several years since he first created a rare resource focused on the operation and execution of the organization that helps companies grow through their talent. With today’s quickly changing Talent Acquisition landscape, Jeremy has made significant updates and added new content that arms leaders with both awareness, and application of how to run the most efficient team. His focus on optimizing in-house Talent Acquisition functions to keep companies running at a higher quality and lower cost includes new chapters on technology, tools, a vast expansion on global recruiting, and managing your Recruitment Process Outsourcing relationships. Readers will also have access to a new dedicated section of this website to further utilize the discussed emerging tools, updated research, and more detailed case studies. Jeremy’s first edition of the book sought to close the gap and create a behind the curtains look at how to lead this niche, but critically important function. 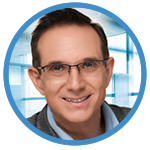 Through his own practice, he has continually guides HR and Talent Acquisition leaders to run more efficient teams with better engaged Recruiters, support teams, and vendor relationships. There are very few functions that evolve as quickly as attracting talent and planning for the emerging needs of companies. RecruitCONSULT! Leadership’s Second Edition continues to deliver guidance, practical use cases, and proven theory to those inside the company, who bring the best talent into an organization and best anticipate talent needs for the future. Showing business leaders that your leadership of Talent Acquisition is delivering faster, cheaper, and better than any other method to secure top talent is important. Regardless if you’re a lean team that is just starting to expand globally, or separating from the HR Generalist function, this book is centered on that specific purpose of leading Talent Acquisition end-to-end effectively. From finding the right Talent Acquisition professionals and structuring them, managing through change and showing your value, Jeremy’s advice will help you form and follow a strategy that keeps Talent Acquisition proactive and engaged instead of reactive and a barrier to get through.